Wondering where to host birthday parties in MN? You need a place that can accommodate a crowd and where you can hang for a while have a great time while celebrating the big event. There are host of places around the state that meet this criteria. One idea you might not have thought of that will provide you with hours of fun is paintball at Air Assault Paintball in St. Paul. Walk in/open hours are noon to five Saturdays and Sundays but Air Assault can be available to your 24/7 with an advance reservation. All you need is a group of 8 or more and private games are available for you and your friends and family! 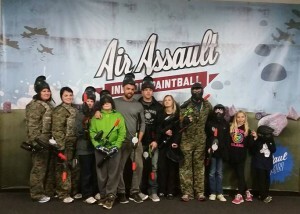 Paintball can be played by individuals or you can divide into teams; set up games with time or ammo limits play capture the flag or make your way around obstacles to launch a surprise attack. Before or after your outing there are a number of great places nearby to continue the party whether you are interested in a fancy dinner or just snacks and adult beverages. Only a few minutes from Minneapolis you can call Air Assault today to plan your big bash. 651-222-0300 or you can email them at [email protected]. Be sure to mention the reservation is for a birthday party and receive a free rental upgrade!